Lisa grew up in west-central Minnesota. She earned her degree in elementary education at the University of Minnesota, Morris and moved to Montana to begin her teaching career in a one-room schoolhouse. 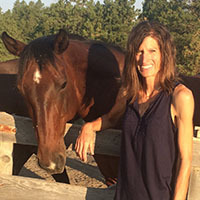 She is a runner, a writer, and a Sunday school teacher, but her favorite thing to do is ride horses with her husband and their three children on their Montana cattle ranch.